Phnom Penh – December 22, 2017. 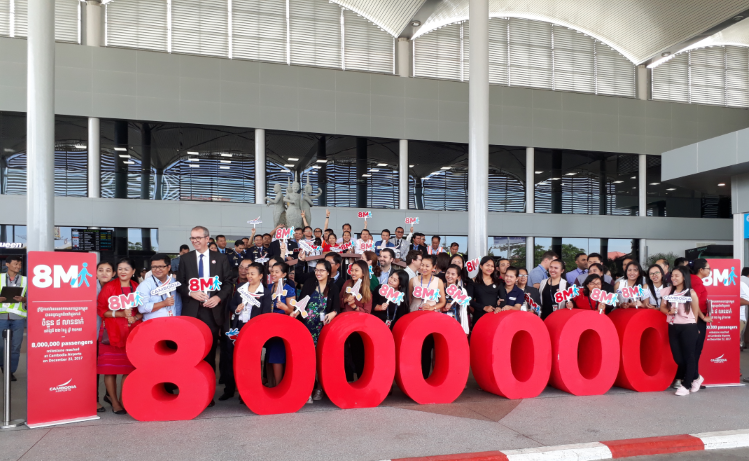 The airports in Phnom Penh, Siem Reap and Sihanoukville record soaring traffic and their combined number of inbound and outbound of passengers reach today the 8-million mark for the first time. This new record follows suit the milestone reached last year when the airports welcomed 7 million passengers. A celebratory event was held this morning at Phnom Penh International Airport, which is likely to finish this year as Cambodia’s busiest platform. Organized by Cambodia Airports, it gathered the whole airport community, from airlines to governmental agencies, and tenants. Since the last 5 years, the international airports in Phnom Penh and Siem Reap have been embarking in a full-fledged overhaul program to accommodate traffics growth. Last week, it materialized again by the official inauguration of Phnom Penh international’s new arrivals halls and extension of the boarding lounge. At the same time, Sihanouk International Airport is completing a terminal extension scheduled for commissioning in the first half of 2018 and about to launch a runway capacity overhaul. The completed and near-end expansions are going to match with visitors expected in Cambodia by 2020, which should, according to statistics of Cambodia’s Ministry of Tourism, reach 7 million. Studies for future development at the 3 airports will be conducted in the coming months. The shareholders of Cambodia Airports are France’s VINCI Airports (70%) and Muhibbah Masteron Cambodia (30%), a Malaysian-Cambodian joint venture. Key drivers for Cambodia’s economy, the international airports contributed in 2014-2015 to 17% of the country’s total GDP and. More than 1.7 million jobs, representing 20% of the working population, were related to their activities. VINCI Airports, a top 5 global player in the international airport sector, manages the development and operations of 36 airports located in France, Portugal (including the hub of Lisbon), Cambodia, Japan, Dominican Republic, Chile and Brazil. Served by more than 250 airlines, VINCI Airports’ network handled 157 million passengers in 2017. Through its expertise as a comprehensive integrator and the professionalism of its 12,000 employees, VINCI Airports develops, finances, builds and operates airports, leveraging its investment capability, international network and know-how to optimize the management and performance of existing airport infrastructure, facility extensions and new-build construction projects. In 2017, its consolidated revenue amounted to €1.4 bn.